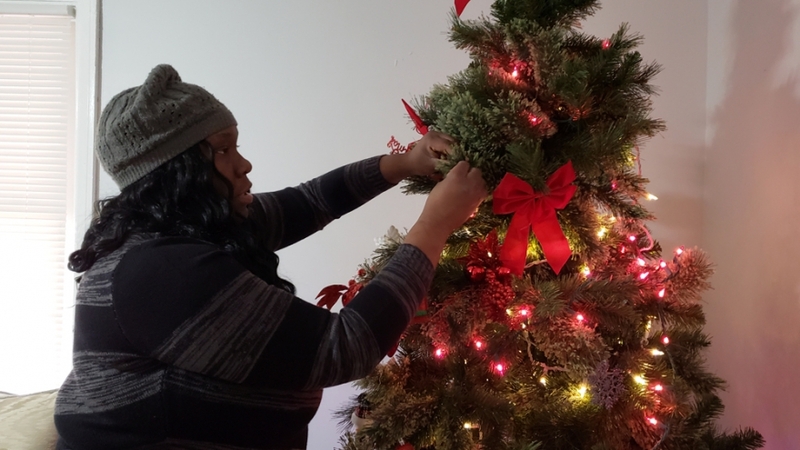 A number of Richmond-area nonprofits are helping people out of homelessness by getting them into rental units as soon as possible. Advocates say they’re seeing positive results from the “housing first” approach. In WCVE’s series Where We Live, Catherine Komp has more. There’s a lot going on at Jameka McDonald’s new place. Some movers are bringing in a bunk bed and her landlord is fixing the furnace. Jameka McDonald: I can feel it warming up out here. In the corner is a festive Christmas tree, with colored lights, red velvet bows and so far, one tiny santa. It’s McDonald’s first. McDonald: I just love the tree itself, it’s a big tree. She pulls a glittery red ice skate from a paper bag of ornaments and hangs it up. McDonald is glowing too. After homelessness and staying at a shelter, the single mom signed a lease November 15. McDonald: It’s my own. It's my own place for me and my kids. I don’t have to stay at nobody's house, sleep on nobody’s couch or floor, or my car. So that was really exciting, it was a big weight off my shoulder, signing the lease. McDonald used to live in public housing, Whitcomb Court. Then her kids’ dad was shot. McDonald: He got shot, he got shot eight times. He made it, you know, but I didn't feel safe staying there with my little kids. She moved in with her mom, splitting the $1,300 rent on a townhome. But after her 12-year-old brother set off a firecracker in a mailbox, she says the landlord gave them 72 hours to move out. After that, she was couchsurfing, staying at motels when she could afford it. Sometimes she could find a place for her sons, but not herself so she’d sleep in her car. McDonald: So ever since then it's been house to house and unstable places and to the point that I had to go into the shelter. I had nowhere else to go, no where else to take them. It was a process to get into a shelter. One night in her car, McDonald remembered 211, Virginia’s social service hotline. They gave her another number, Richmond’s housing crisis hotline. She left a message, but then her phone got shut off. Eventually, she got on the waiting list, having to buy time at a friends’ place by helping out with groceries. She finally got notice that there was a space for her and her sons at Housing Families First. McDonald: I love that place. I say it changed my life in so many ways. McDonald’s journey from a shelter to having a place of her own took about 10 weeks. Beth Vann-Turnbull: You can do so much more when you know where you're going to live, where your kids are going to go to school, how close you are to work. When you know where you're going to live and you have that stable foundation, it's much easier to engage in everything else. Beth Vann-Turnbull is executive director of Housing Families First. The non-profit uses a “housing first” philosophy. It’s a national approach that’s expanded over the last decade with the help of federal funding and “rapid rehousing” programs. The goal is get people back into housing as soon as possible. In addition to connecting clients with supportive services, nonprofits help pay for deposits and the first few months of rent. Vann-Turnbull’s organization has run the Hilliard House shelter since 2001. Back then, she says the model was different. There were intensive services on-site and families often stayed for a year or longer. Vann-Turnbull: What we found over time, and when I say we I mean researchers nationally agencies nationally, it's much cheaper just to pay that deposit and move people into housing rather than keep them in the shelter for a year or two to saving money. And it’s not just cheaper, it’s effective, says Vann-Turnbull. About 85 percent of Richmond-area families did not return to homelessness within a year of exiting their program. Vann-Turnbull: It's about whether you're in shelter or not helping you find a place that is as affordable as possible, meets your needs, helps you get in there, connect other resources, hopefully increase income and position you to be stable. It’s not an answer to poverty, says Van Turnbull, or to the shortage of affordable housing. And it can be a challenge to find landlords willing to see the potential of tenants who have bad credit or an eviction on their record. Joe Fields: We hope that sometimes we maybe kind of look through that and hopefully that's maybe a new start for the person. Eva Fields: And that's a good feeling. Joe and Eva Fields are renting to two clients from Housing Families First. Since they became property owners over a decade ago, they had a guiding principle: they would not rent homes they wouldn’t live in themselves. Eva Fields: And we said we’re going to keep that promise. They try to keep things affordable, between $750-$850 for two to three bedroom homes. Joe Fields is the handyman, and he worked non-stop to get this property ready for Jameka McDonald. He gave all the walls a fresh coat of paint, put in a new washer and dryer and a shiny, green tile backsplash in the kitchen. Eva Fields: Love your tree, love your tree! McDonald shows Eva Fields around, including her new bedroom, the first one she won’t have to share with her sons. In the dining room, a donated wooden dining set sits in front of a window overlooking the backyard. Mrs. Fields says kids love to look out the window, but that’s a recipe for broken blinds. Eva Fields: Draw your blinds up enough for them to look out without breaking them out. And if the pipes under the sink start dripping, she says call Mr. Fields. Eva Fields: That will prevent a lot of work for him and there are many other things, but we’ll talk about them as we go. And with that last bit of advice, Fields embraces her tenant. Eva Fields: I’m going to hug you one more time. After moving in, McDonald said she started feeling better physically. People at work noticed she was happier. She says getting into the Housing Families First shelter, changed her trajectory. McDonald: I am not ashamed of nothing I went through. I feel like it was the best thing that ever happened to me and the children. I really do honestly. It was the best thing to happen to us. McDonald has friends and family members facing unstable housing too. She says more landlords should consider people’s circumstances, not just their credit score. McDonald: What does a light bill have to do with somewhere to stay? They need to make better laws for that especially for people with children that don't have nowhere to go. Especially if they don't have a criminal record, I don't have a criminal record, I don't commit crimes. My record is clean. I don’t even breathe hard in public. So for me to get denied because my credit score isn't 600 or something like that is terrible. McDonald also wants to change perceptions and end the myth that people who need services aren’t working hard enough. McDonald: I mean show a little compassion to these moms and these families. We work hard, being a mom is not easy. It's a full-time job, even if you go out the house and work a full-time job. It's a full-time job. Our work is never done. McDonald works full-time at Walmart, and is looking for another part-time job when things slow down in January. She’s also starting GED classes early next year. She’s knows time and money will be tight, but she’s got a budget and is already saving. McDonald: I'm looking forward to Christmas when they open these gifts under the tree. I'm looking forward to when it snows and we can play in the snow and come back in the warm house and be warm. I'm looking forward to birthdays. We could decorate and make a cake, stuff like that. So I'm just looking forward to everything summertime, getting a the pool. Just being able to be here, we don’t have to go house to house, we know where we’re sleeping, we know what’s in our house, our clothes, our food. I’m just looking forward to being settled. Housing Families First has helped more than 800 people over the last four years through their permanent housing program. The vast majority, about 80%, are families with minor children. The organization says they’ll be able to get hundreds more in to housing following a $2.5 million grant from Jeff and MacKenzie Bezos and the Day 1 Families Fund. Other groups using the housing first model in the Richmond area including St. Joseph’s Villa, HomeAgain, Hanover Safe Place and Virginia Supportive Housing. Catherine Komp, WCVE News.